Dubai-based Kaire Kalam traveled deep into the heart of Rub' al Khali, the world's largest desert. A reader story. RUB' AL KHALI, United Arab Emirates – I've failed. 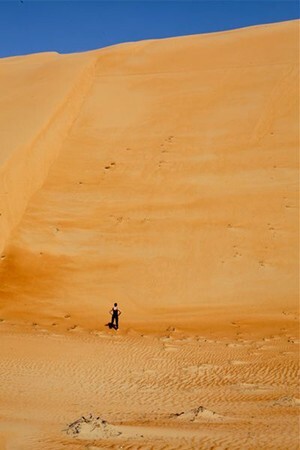 They lie there shaking their heads and yawning lazily despite my attempts to make them hike up a 200-meter sand dune. I'm left alone, face to face with the giant. 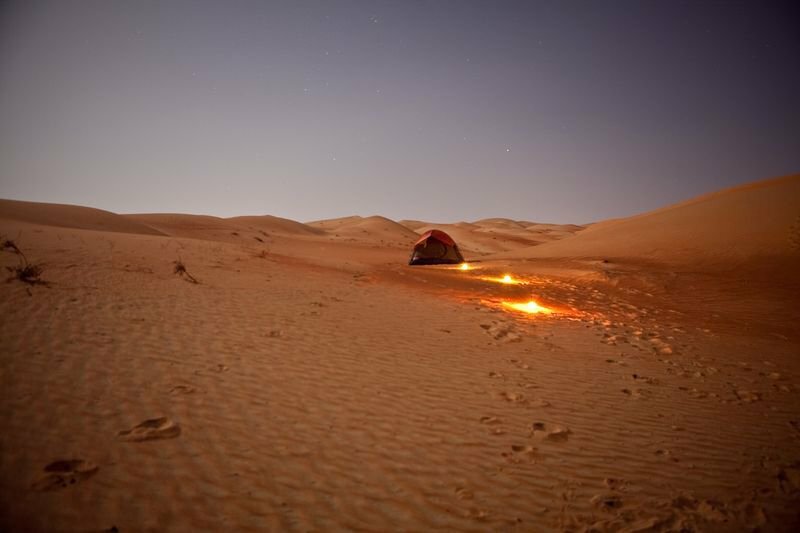 I talked my American, Iraqi, Canadian, and Finnish friends into camping in the desert. Four hours south of Dubai lies the massive It's the largest continuous sand desert in the world, covering 650,000 square kilometers. 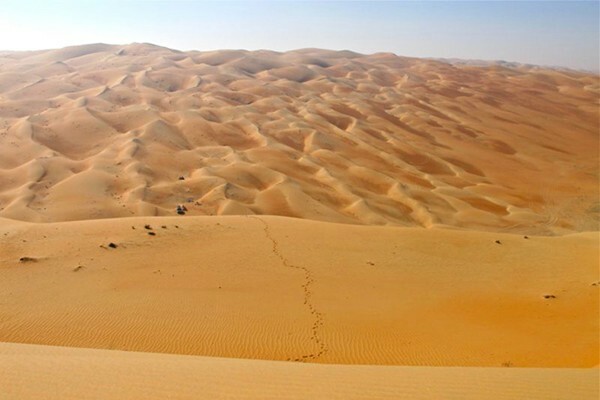 Empty Quarter, as it is also known, is mostly contained within Saudi Arabia but also reaches Oman, Yemen, and the United Arab Emirates. It's a home and playground to Bedouins and their camels. Within the UAE, it's an amazing opportunity for tourists to pitch their tents free of charge and experience a Bedouin lifestyle. Conventional wisdom says that travel to the Empty Quarter is no joke. It's dangerous, requiring serious preparation and at least three four-wheel drive vehicles. This is a standard desert off-roading practice, which ensures that if one car gets stuck in sand (which is pretty much inevitable), the second car can pull it free. If the second car gets stuck, the third can get everyone out safely. Or you can forgo the serious dune-bashing and take the asphalt roads and gravel tracks that wind through the desert. 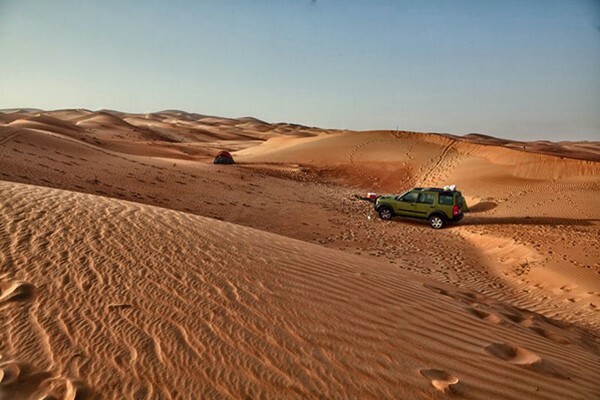 A single 4×4 vehicle can avoid plunging into the hazardous dunes when traveling alone. With short notice and only one 4×4, we decided to attempt our journey on asphalt and gravel. The five of us packed our tents, sleeping bags, flashlights, cell phones, firewood, and food, and hit the road. After a few hours of dull, flat, grayish sand, the desert started to show a new side. The sand turned a deep reddish-orange and roaming camels became a regular sighting. As we moved along the winding highway, dunes grew in size and changed in shape and form. We were getting a sense of this powerful wilderness. Sand floated over the man-made road in thin layers, a constant reminder of nature's perseverance. Sunset was fast approaching, so we took our chances with one of the nearby tracks off the main road. It steered us deeper into the desert. We let out air from the tires, switched to four-wheel drive, and continued looking for a place to pitch the tents. We passed a few "sabkhas," white salt flats, a remnant of the ancient lakes that used to exist here. Rainfall causes them to soften, and they can become impassable by even a very capable 4×4. We soon came upon a monster of a dune hunkered down on one side of the road. Across from it was a flat area nestled inside a large three-sided bowl of soft, undulating red sand. The deal was sealed and a unanimous decision was made. We had found our perfect campsite. For as far as we could see in all directions, there was no sign of life. Only the giant dune loomed over us. We stared at it in awe and imagined what the views would be like from the top. We swore that in the morning we would climb it together. The sun woke us as it broke through the clouds and cool morning air. Before long I was restless to start the journey up the dune, which was quietly taunting me. My friends seemed to have forgotten their promise. I crossed the road alone. I sunk into the earth with each step. Grain by grain, sand crumbled over and covered my feet. Walking didn't work, so I dropped down to hands and knees and crawled forward. The sun got higher and hotter by the minute and I was soon out of breath. After 20 minutes of exhaustive scrambling, I reached the top. Golden dunes lay unbroken in every direction like waves across the ocean. The Bedouins refer to the Empty Quarter as the sea of deserts, and now I know why. High up on the shoulders of this monster dune, the silence was almost disturbing. I contemplated how powerful, hostile, and gorgeous the environment is, and how tough the Bedouins must be to survive it. I wondered how long I had until word got out, until we were charged entry fees into the spectacular desert. And I was equally pleased to be by myself. After some time, I took long leaps down to the camp — the sand came alive, making unexpected musical sounds and squeaks beneath my feet. Only a few short minutes and I was back at the bottom, leaving behind a long vertical trail that would soon be smoothed over by desert winds. Take route E11 past Abu Dhabi, toward the town of Madinat Zayed. For a more scenic trip, drive towards Abu Dhabi airport, turning off onto Tarif Road at Junction 306 and heading toward Hameem. This way will take longer, but allows you to stop at the . 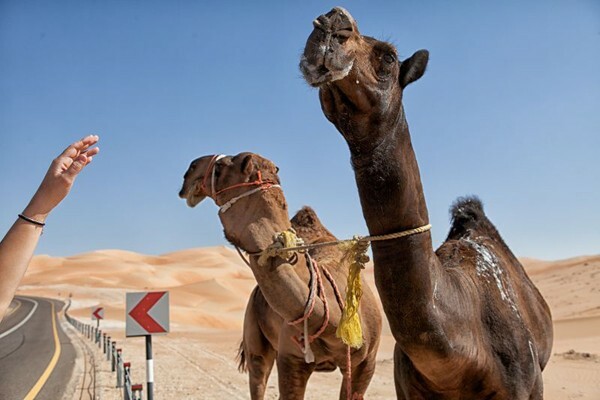 Both routes will head out to Liwa Oasis, a strip of villages bordering the Empty Quarter. From there, follow signs to Al Moreb Hill, a location used for competitive hill climbs. Do you have a compelling travel story to share? Popupla wants to hear it.